Use our PERLAVITA PavÈ rondelles to take your bracelet to another level. Covered with peridot colored crystals in a near pavÈ style, these beads feature a threaded sterling core, making them compatible with most brands of large hole bracelets. 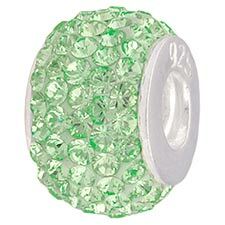 The color can be used for a December and June birthstone color. Approximately 9.5mm wide and 14mm in diameter.